Motion (the UK’s Chris Coode) makes stunningly subtle works out of sensuous vestiges of melody and digital space. Like an awakening insect, “T.Mis F” opens Dust, Motion’s debut 12k cd with sparse fragments of warm tones, lo-fi creaks and bass frequencies. Equally as organic, “Plan B” conjures up images of a lifeform emerging from a murky pool of liquid. 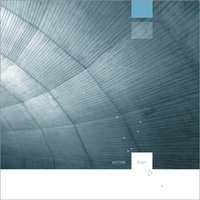 Slowed-down chords and tonal scrapes play over a soft, hushed noise. A quiet cd, Dust engages and focuses the listener, and rewards with repeated listening. Dust marks Coode’s 2nd full length release. Previously Motion produced the Pictures cd/lp in 2001 and a joint 12” with San Francisco artists Matmos on the UK label Fat Cat’s Split Series in 2000. Upcoming MP3 work is scheduled to be released later this year on the Italian web based label Tu M’.